Time for a couple of reviews on some Avery Brewing (@averybrewingco) beers that my friend Danielle Wheeler was nice enough to bring me from Tennessee! These will be the third and fourth Avery brews on my 365 in 2011 mission, but the first two (Hog Heaven Barleywine and DuganA IPA) were part of the bigger series of beer, and these are both out of Avery's year-round lineup. Let's see how they compare! 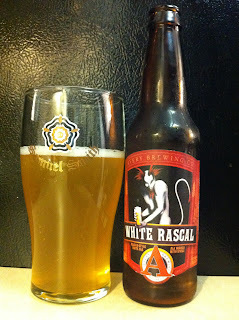 Up first was the White Rascal Witbier, which I poured from a 12 oz. bottle into a standard pint glass. It's a hazy yellow color with a really small head. Nothing really special to look at, but you can't always judge a book by its cover. Now the aroma is more like what I was expecting out of Avery! Spicy and sweet with a large helping of coriander. The taste is more of the same, spicy, lots of coriander and hints of citrus. The spices blend well together and compliment each other. It's pretty thin though, with not much body to it. Decent beer, not the best ever but satisfying and refreshing. Second up, the Out Of Bounds Stout, an Irish-style dry stout that is also one of Avery's year-round releases. And... into an imperial pint glass it goes, it's a dark nearly black beer with a finger of off-white head. The aroma is like dark roasted chocolate. It's not too strong with a bitter tinge to it. The taste is the same flavor, bitter and roasted. The taste is a little more crisp and clean than the aroma, with a smooth finish. It's a little thin but that's typical for a dry stout. Another decent beer, but not one of my all-time favorites. And with that done I can say that Avery makes some pretty solid year-round brews, but they don't quite stack up to the special releases. This is pretty typical though, even the local guys, Abita, don't measure up to their select releases with their year-round beers. Of course, the year-round beers are also usually cheaper! So they have that going for them, which is nice. Thanks again, Danielle! I owe you a few beers. A Shoutout To Samuel Adams! Abita Beer Announces Plans To Can Flagship Beers. Lazy Magnolia Getting Crazy At The Londoner!